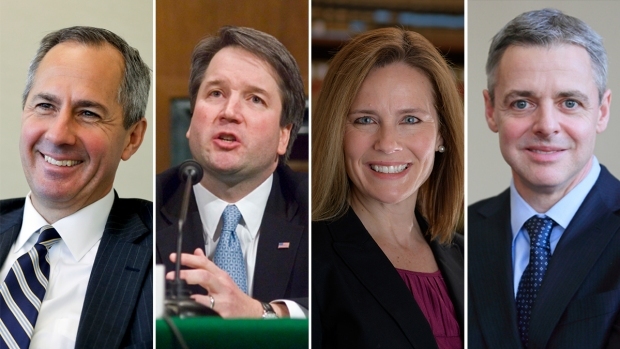 About 6 in 10 Americans believe the Republican-led Senate should vote on President Donald Trump's nominee to the Supreme Court before the midterm elections in November, according to a new NBC News|SurveyMonkey poll. Trump will announce his choice to fill Justince Anthony Kennedy's seat on Monday, but some Democrats have argued that the vote should be held only after the elections. Only one-third of those surveyed in the poll said the Senate should wait until after the elections to vote on confirming the nominee. Sixty-one percent of Americans want a justice who would uphold Roe v. Wade, the case that legalized abortion, the poll found, and a majority of independents wanted Trump to nominate a moderate.